We’re not done yet. There are still beautiful vegetables to pickle. 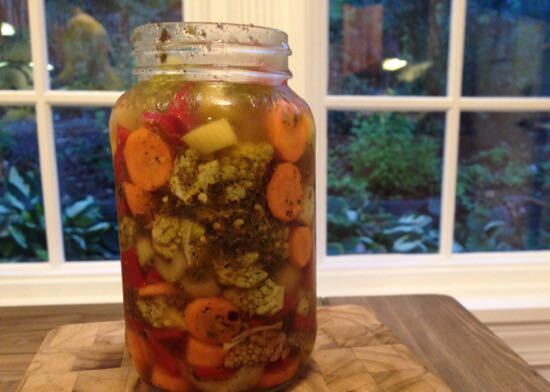 Make giardiniera, a delicious Italian refrigerator pickle now, and enjoy it all fall. Make it again a week before Thanksgiving and have a crispy, briny, colorful addition to your holiday table. Buy the prettiest cauliflower you can find because that’s the star of this show. Like spicy? Add jalapeno, serrano or even a habenero or scotch bonnet (depending on your heat preference.) Or leave the chiles out. Your choice. Want to use this like Chicagoans do, atop a hot dog? Chop the vegetables extra small. Or, do as I do, and keep them big enough to sneak a snack from the jar on the way to making dinner. Book launch is 10 days away, friends. If you’ve preordered, your book should be in your hands in the next two weeks. I hope it will be in your neighborhood book store and, if it isn’t, please ask the proprietor to bring it in! Won’t you come see me at one of the many events planned around the country? Here are three ticketed events that should be especially entertaining. If you’re in DC, please consider coming to the Sixth & I event on November 3. I’ll be in conversation with my good friend Bonnie Benwick, Deputy and Recipe Editor for the Washington Post Food section. In New York City, I’ll be at the 92nd Street Y on November 13th, in conversation with my friend, food writer extraordinaire, Charlotte Druckman. In Berkeley on November 16th at Revival Bar + Kitchen, Chef Amy Murray is hosting a fried chicken and book dinner. This will be a small and intimate event, a great chance to chat and get to know each other. Find a complete list of all the book events here. I can’t wait until you have the book in your hands, and I so hope to meet every single one of you somewhere along the way. In a large bowl, mix the vegetables and salt until well combined. Cover the vegetables with non-chlorinated water. Place a plate atop the vegetables to keep them submerged and set the bowl aside, unrefrigerated, for 8 to 12 hours. Drain the vegetables and rinse thoroughly. In one of the two quart jars, combine the garlic and all the herbs and spices; add the vinegar and oil and shake well to emulsify the dressing. Pour half the dressing into the other jar. Pack the vegetables into the jars. 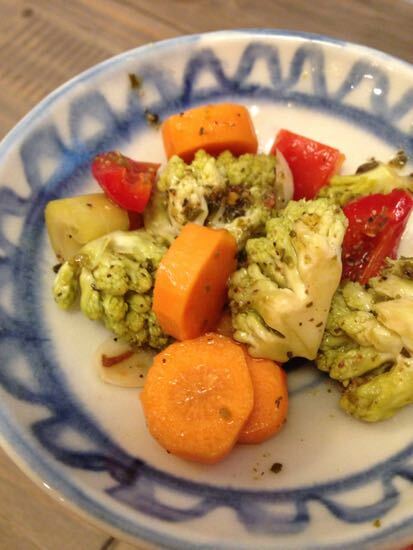 If vegetables are not completely coated, make and add another half recipe of dressing. Screw lids onto jars and leave them on the counter to brine for two days. Once brined, refrigerate. The pickle will keep for a month or more. I’m going to give this a try – looks easy and will likely be way better than store bought. Love pickling! soooooo delish! no reason not to have this around all the time. 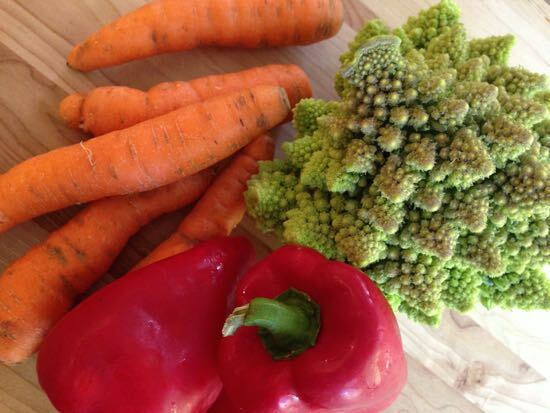 i went with a bigger cut; added less sweet peppers, more celery and carrots & cauliflower (oh my! ); and held back on the red pepper flakes until the jalapeño finished its business. next time, i think i’ll make the initial brine with hot water so the salt dissolves, and let it cool before adding the veg. a lot of the salt had gathered on the bottom and didn’t join the party. what i should have said is: i’ll be contacting the guinness world record folks to find out if they would consider establishing a “most amount of giardiniera pickle eaten in a week” record. HAHAHA Anna, you slay me. I might qualify for that particular competition and my cousin in law Jonah could hold his own, too. Love the new site, Cathy. Any advice on canning giardiniera? Most recipes I see have way too much sugar.